The trouble with Leo and Pisces compatibility is that this is something of an uneven match. Royal Leo is demanding of support in a partner, whereas gentle Pisces, the zodiac’s resident Dreamer, often needs support themselves and is too wrapped up in their own little world to adore Leo the way Leo wants to be adored. 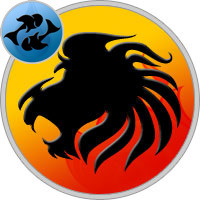 Leo’s strength of personality can also intimidate Pisces, who risks being swallowed up and becoming an afterthought in this relationship. Can it work? On some levels, yes, but it’s a complex affair. Leo and Pisces compatibility can be as wondrous as a fairy tale, or as disastrous as your worst nightmare. Read on to find out more, or ask our astrologer if you have a question about this relationship or any other astrology compatibility matches. A date between Leo and Pisces can be surprisingly typical. Movies and plays are favorites of Pisces for their escapism value. Plays and other cultural events suit Leo’s taste for upscale activities. Astrologically, Leo is zodiac royalty, and expects to be treated kingly. To attract this lover, give a lot of compliments and acknowledge Leo’s famous generosity. Any social event that provides Leo with the opportunity to dress up is a favorite. Having the chance at a grandiose entrance is icing on the cake.